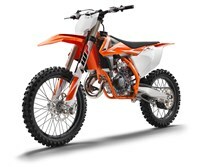 The engine of the KTM 150 SX was developed with the latest know-how and state-of-the-art technology. That’s the only way to craft class-leading power all across the rev range. This is the lightest and most compact 150cc motocrosser you’ll find. So prepare for surprisingly fast lap times and baffling rideability. As this motorcycle shares many of its key components with the class-leading KTM 125 SX, the cylinder, head and piston unit can now also be fitted on a 125cc engine base converting it to a KTM 150 SX without replacing the crankshaft. Buy one, get one free. Nearly. This compact cylinder with a 58mm bore features a cutting-edge power valve unit with a sophisticated mechanism for the lateral support exhaust ports. Matched to a twin-component cylinder head, it is KTM’s secret to all-round grunt. The layout of the water jackets in the cylinder and head guarantees efficient heat dissipation when the going gets tough. A robust 6-speed transmission was designed specifically for the small 2-stroke engine, its gear ratios are perfectly in sync with the 150’s power band. The latest production technologies allow for compact dimensions and minimal weight. An advanced ´No Dirt´gear lever design prevents mud from clogging the folding tip for reliable shifts even in the worst conditions. This reliable piece of engineering has been skillfully balanced to guarantee minimal vibrations. In its latest form, it allows a decrease of the displacement to 125cm3 just by replacing cylinder, piston and head. There’s no longer the need to change the crankshaft if you want to change displacement. Two-in-one in no time. The KTM 150 SX is fitted with a MIKUNI TMX carburetor. This 38mm flat slide carb lives to provide smooth and controllable power all the way up to the rev limitation. With a new intake manifold the carburetor is turned 7° in order to reduce the overflow of fuel. And it’s less sensitive to different altitudes and temperatures, so you can pin it wherever, whenever.